Imagine walking into a theme park with a 6-year-old, and leaving just in time to drop them off at college, 12 years later. 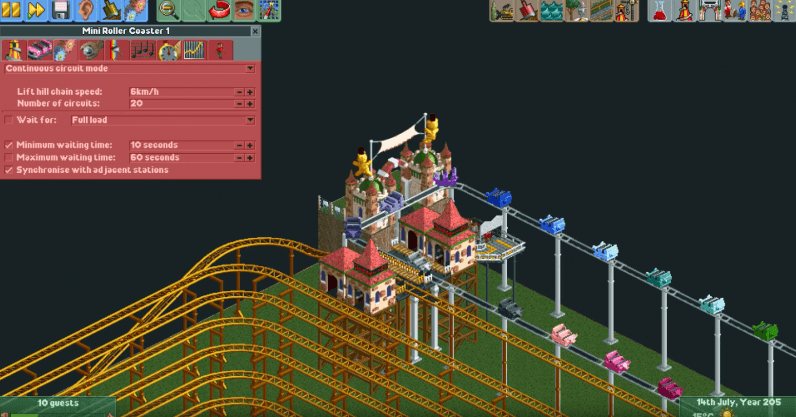 Vos tapped every square pixel of digital real estate in his Roller Coaster Tycoon 2 theme park. Distance, though, is secondary to the sort of languid pace that makes your average waterpark’s lazy river seem like an interstellar dogfight in Star Wars. All told, Wild Mouse, if it were a real coaster, would meander through some 600 laps, each more boring than the last. Marathon ride aside, it’s not just the distance that’s concerning. From a time commitment standpoint, riders would need to pencil in 4,587 days to complete the ride. That’s 12 years, 207 months without a bathroom break, a hot dog at the concession stand, or one of those giant souvenir cups full of watered-down cola. I hope your employer has a generous vacation policy.